Citytrip Barcelona – Barcelona, city of sun, fun, culture, good food and amazing sights, is the ideal destination for your city trip! The city buzzes day and night. Not only has Barcelona many wonderful sights, it is also a seaside resort. The sun, the beach, the atmosphere, the food and the relaxed pace of life in Barcelona make the city a perfect stay for several days. Barcelona is the capital of Catalonia and is situated in the northeast of Spain on the Mediterranean. The city proper has more than 1.6 million inhabitants and greater Barcelona has more than 5 million inhabitants. Only Madrid, the capital of Spain, is more densely populated. Barcelona is world famous for the works of art of Antoni Gaudí. This famous architect was born in a town in Catalonia in 1852 and moved to Barcelona for his studies. 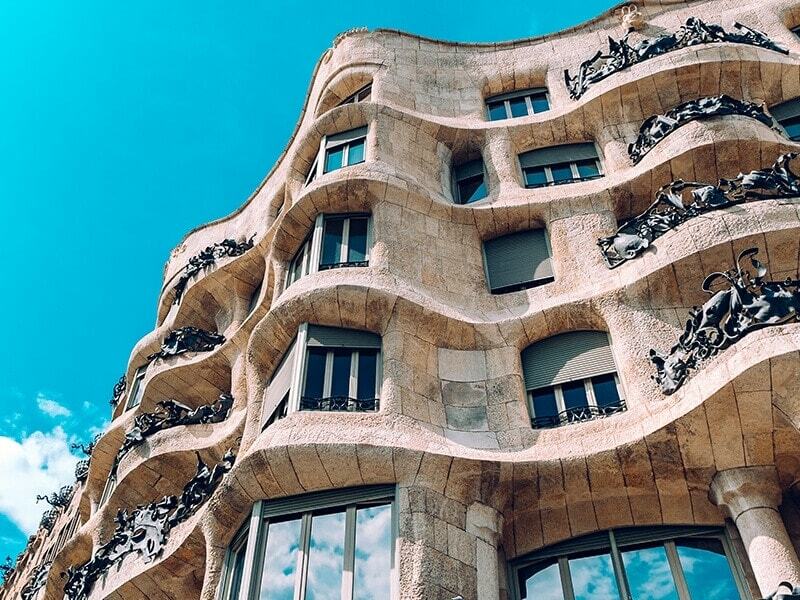 The city prides itself in many attractions which this famous architect designed, best known are Sagrada Familia, Parc Guell, Casa Batlló and Casa Milà. In addition to these superb sights, Barcelona is also worth a visit because of its vibe and variety of things to do. Amble up and down Las Ramblas, Barcelona’s best-known landmark. Get (almost) lost in the maze of alleys and lanes in the Gothic Quarter. Visit swanky shops and stylish restaurants in trendy neighborhoods such as El Born, El Raval and Gracia. Stroll along the quiet beach dotted with beach bars. The Barcelona Card, valid 3, 4 or 5 days, is a comprehensive city pass. This card allows you free entry to 25 museums and attractions in Barcelona. In addition, you will get a discount at other museums, attractions and activities. What’s more, public transport is free and unlimited. Train and metro from the airport are also included. You can add the Gaudi Bundle which includes skip-the-line tickets for Sagrada Familia and Parc Güell. The Barcelona City Pass allows free and skip-the-line entry to the Sagrada Familia and Parc Güell, the hop-on hop-off bus. A transfer by shuttle bus from the airport (Girona or Barcelona Airport) to your hotel is also included. The Barcelona iVenture Card allows free and fast-track entry to 3 or 5 of the main attractions, museums and tours in Barcelona. The iVenture Unlimited Pass even allows you free entry to as many as 30 attractions, museums and tours in Barcelona! Articket Barcelona offers the possibility to visit six of the most important museums in the city at a very attractive price. Moreover, you do not have to wait in the queue. The Articket Barcelona allows skip-the-line entry. The Hola BCN Card offers free public transport in Barcelona for 2, 3, 4 or 5 days. With this card in your pocket, you can travel by metro, bus, tram and train without restrictions. Transport to and from Barcelona airport is also included in this card. The Costa Brava Barcelona Day Pass entitles you to a return ticket by luxurious coach from the Costa Daurada (from various locations) to Barcelona or a parking spot for your car in Barcelona city centre and skip-the-line tickets for the Sagrada Familia and also tickets for the Hop-on Hop-off bus including an audio guide. In addition, you will get a discount at other sights and museums in Barcelona. The Costa Daurada Barcelona Day Pass entitles you to a return ticket by luxurious coach from the Costa Daurada (from various locations) to Barcelona or a parking spot for your car in Barcelona city centre and skip-the-line tickets for the Sagrada Familia and also tickets for the Hop-on Hop-off bus including an audio guide. 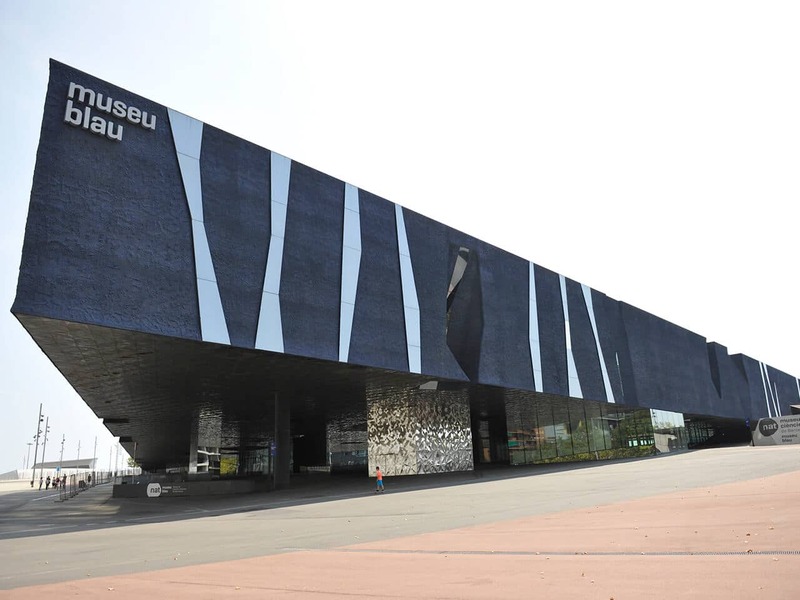 In addition, you will get discounts at other sights and museums in Barcelona. Barcelona has three airports: Barcelona Airport-El Prat, Girona Airport and Reus Airport. Low-cost airlines fly to one of these Barcelona airports from many European cities. Barcelona Airport-El Prat is the closest to the centre of Barcelona at a distance of only 16 km. This airport has two terminals. Newly-built Terminal 1 handles KLM, Brussels Airlines, Vueling and Iberia flights. Terminal 2 has a direct train connection to Barcelona centre and handles Transavia, Ryanair, Jetairfly and Germanwings. Flights to Girona Airport or Reus Airports are often cheaper but the drawback is that these two airports are much further away. Girona Airport is about 90 kilometers north of Barcelona and the Reus Airport is about 100 kilometers from Barcelona. Low-cost airlines such as Ryanair, Transavia and TUI fly go to these two airports. Once you have arrived at the airport, it is best to travel to the centre of Barcelona by public transport. You have several options: metro, bus (or Aerobús), train or taxi from Barcelona El Prat Airport. The Aerobús is the fastest way to get from the airport to the city centre whereas the regular city bus (line 46) is the cheapest option. The blue and comfortable Aerobus shuttle buses arrive at an interval of every 5 or 10 minutes and it is a 35-minute journey time from the airport to the city centre (and vice versa). There are several stops in in the city. A single ticket from the airport to the city centre costs € 5.90. Please note that there are two terminals. Make sure that the Aerobus you board in the city centre takes you to the correct terminal. Another option is to take the new metro line L9 Sud. The metro has stations at both terminals. It is a 30-minute journey to Zona Universitària metro station (L3). Metro stations on the way are: Collblanc (L5) and Torrassa (L1) where you can change to another metro line to get to your final destination. A metro ticket costs € 4.60. Trains to Barcelona leave from Terminal 2. The R2 Nord train stops west of the centre at the Sants train stations (23 minutes) and Passeig de Gràcia (28 minutes). The price for a single trip is € 4.20. A taxi ride from the airport is approximately €30 to €40, depending on your destination in the city. TIP: Purchase Hola BCN! Travelcard online, pick it up on arrival at the airport on then use it straightaway on the metro, train or bus 46 to the city. 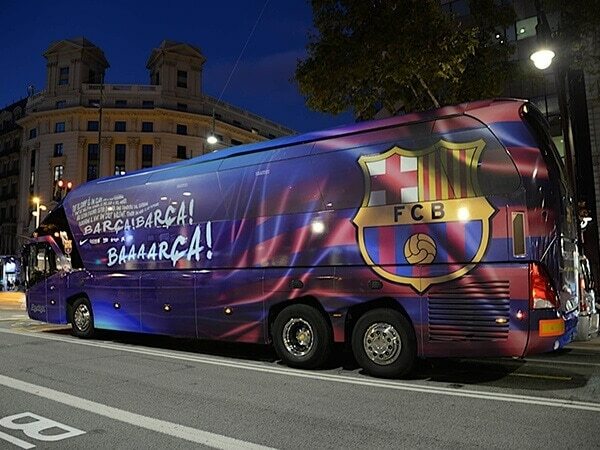 If you travel from the airport of Girona (92 km from Barcelona), it is best to take a bus. Sagales buses go direct to the Estació Nord bus station in Barcelona, close to the Arc de Triomf metro station (metro line L1). Journey time is 1 hour and 15 minutes depending on the traffic. A single ticket costs € 16 and a return ticket is € 25. The departure times of bus line 604 synchronize with Ryanair flights’ arrivals. Hispano Igualadina buses go from Reus Airport to Barcelona (104 km). A single ticket costs € 14 and a return ticket € 24. The journey time is just over 90 minutes, depending on the traffic. There is a stop at Sants Estació next to Sants Estació metro station (L3 and L5). Barcelona has a wide range of accommodation from hotels to B&Bs and from apartments to hostels. There is so much choice that finding the right place to stay may be challenging. Accommodation in the Barri Gòtic, El Born or El Raval neighbourhoods are close to the centre and within walking distance of the main attraction The L’Eixample neighbourhood is further away from the centre yet a good neighbourhood to stay because of the fast and frequent public transport. If you want to splash out, go to Arai 4S Monument (Avinjo 30), a luxury 4-star hotel at a top location. Boutique hotel Room Mate Pau (Carrer Fontanella 7), Hotel Casa Bonay (Gran Via de les Corts Catalanes 700), Hotel España Ramblas (Carrer de Sant Pau 9) and W Barcelona (Placa de la Rosa dels Vents 1) are also very good options. These hotels offer luxury which is reflected in the price. Barcelona also has more budget-friendly hotels like Chic & Basic (at 6 locations in Barcelona), Hotel Praktik Rambla (Rambla de Catalunya 27), Hotel Center Gran Via (Gran Via de les Corts Catalanes 573), Andante Hotel (Avenida Drassanes 23), or Retrome Barcelona (Carrer de Girona). B&B accommodation like B & B Salsas & Co on the Avenida Josep Tarradellas 147 is ideal for travellers who like to stay in small hotels and appreciate personal contact with the owner. If you are on a tight budget and you do not mind sharing a bathroom and not having a private room, a hostel (‘hostales’ or ‘pensiones’) or a youth hostel is your best option. Pleasant and hospitable hostels in Barcelona are: 360 Barcelona Hostel (Carrer de Bailen 7), One Sants Hostel (Carrer de Casteras 9) and Casa Gracia Barcelona Hostel (Passeig de Gracia 116B). During your city trip to Barcelona you need not worry that you will get bored. 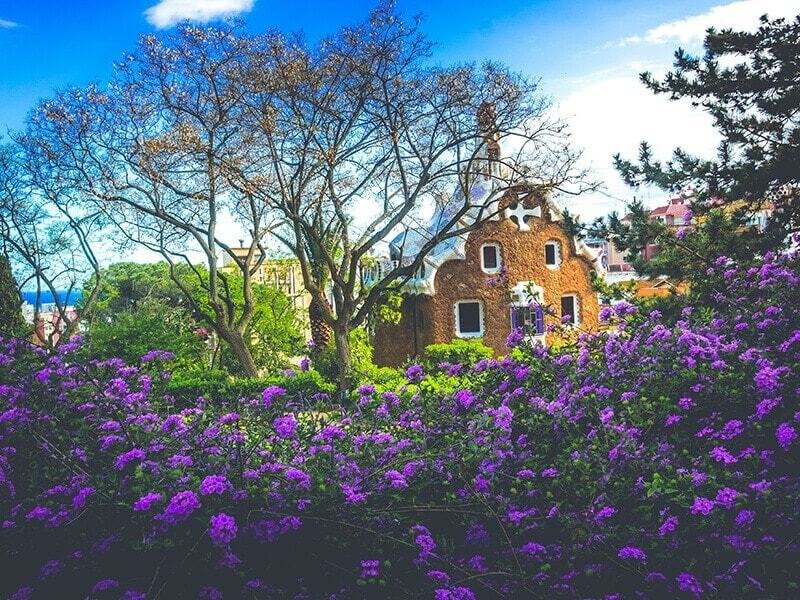 This city brims with sights, attractions and museums. 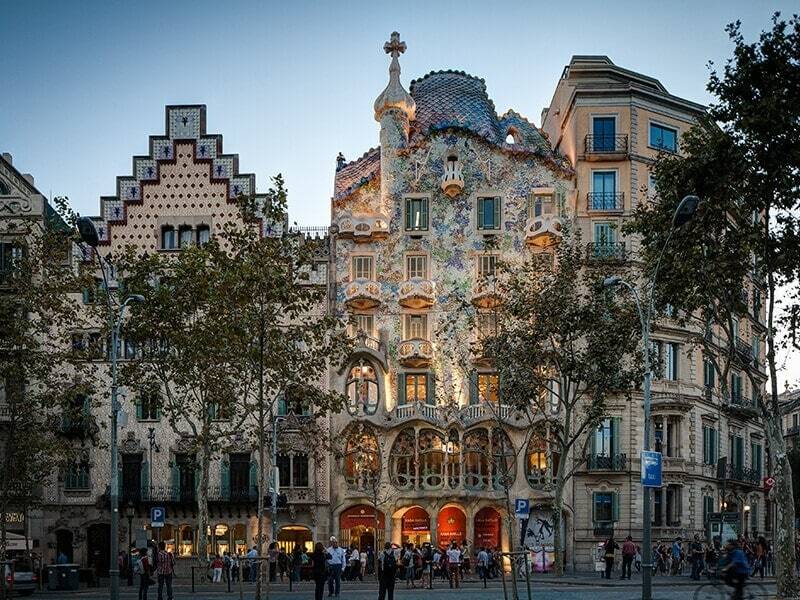 The architect Antoni Gaudí has left his mark on the city. Clear examples are the Sagrada Familia, Parc Guell, Casa Batlló and Casa Milà. Do not miss out on other attractions such as Mirador de Colón, Las Ramblas and Mount Montjuic as they are also worth a visit. Be sure to go to Camp Nou, the impressive football stadium of FC Barcelona, the beautiful beaches and the trendy neighbourhoods of Gracia, El Born and El Raval. The Sagrada Familia Basilica is located in the Eixample district on Calle Mallorca 401. Many other points of interest are close by. Take metro L2 or L5 and get off at metro station Sagrada Familia. The Basilica of the Sagrada Familia, Barcelona’s landmark, is one of the city’s most popular attractions. Construction began in 1882 and has not ended yet. This means that some parts are already in bad repair and renovation is due. The church was designed by Francisco de Paula del Villar, but after an argument with his patron Antoni Gaudí took over the assignment in 1883. 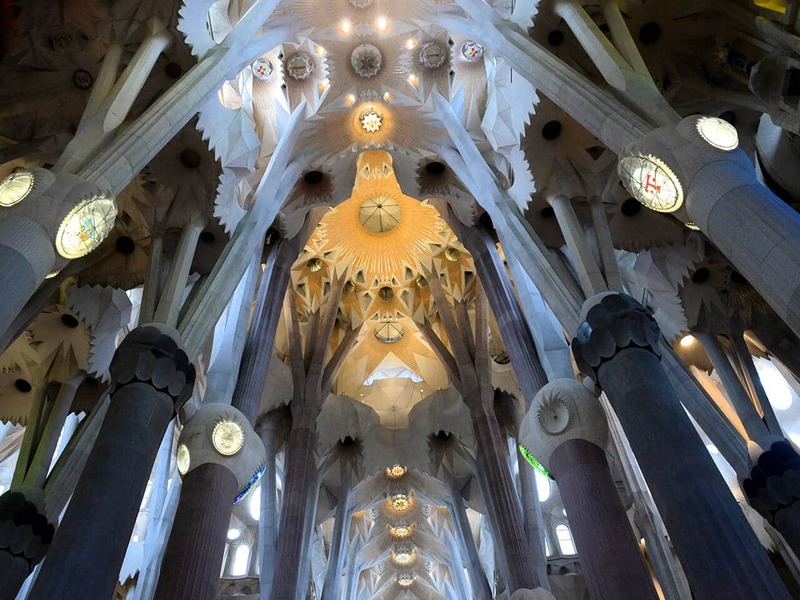 The unfinished basilica is regarded as Gaudí’s masterpiece and magnum opus. Gaudi worked on it for more than 40 years. In 1926, he was run over by tram and died of the consequences. He is buried in the crypt which is also the oldest part of the basilica. 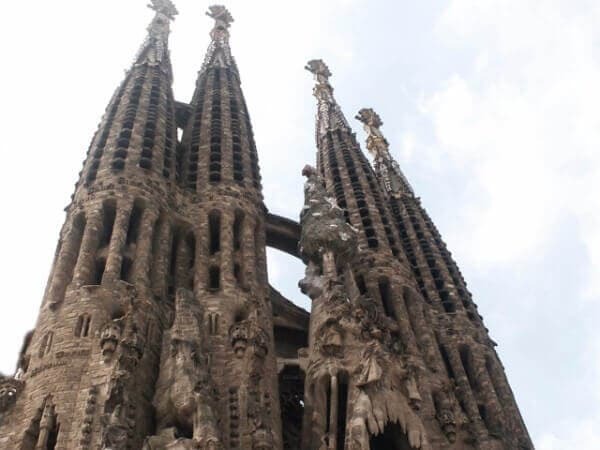 Its completion date is set for 2026, 100 years after Gaudí’s death, but if this will be realized remains the question. The church has three façade, each representing one of the three important stages in Christ’s life: birth, passion, death and resurrection and the present and future glory. The façades of birth and passion have been completed. At the front the façade of future glory is still under construction. Gaudi planned 18 towers of which the tallest would reach 170 metres in height, almost the same height as Montjuïc, Barcelona’s highest hill. 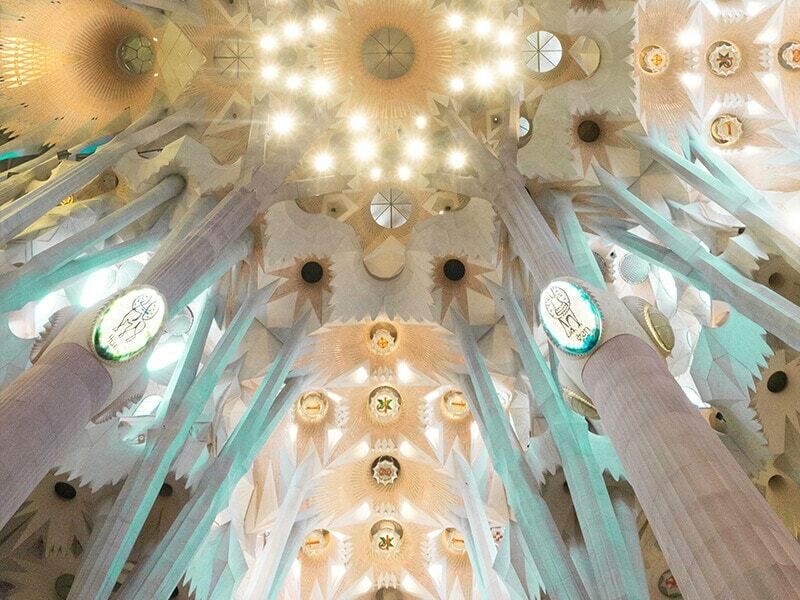 Gaudi wanted to construct a cathedral that changed the skyline and at the same time showed respect for the work of God. The spires are like trees and branches that support the roof and diffuse the light. The sun shining through the stained-glass windows creates a magical atmosphere. Every year millions of people visit the Sagrada Familia which results in long queues, often more than a hundred metres long. Therefore, it is highly recommended to purchase tickets online in advance. Take metro line L3 and get off at stations Lesseps or Vallcarca. It is about 15 to 20 minutes walking to get to the park. Alternatively, take bus line 24 or 92, they stop close to the park. Park Güell is one of the highlights during your city trip to Barcelona and one of the most popular hotspots. Its construction began in 1900 on the instigation of the Spanish entrepreneur, Eusebi Güell, who assigned the design of the park to Antoni Gaudí. Gaudi envisaged a residential park and sixty villas. Unfortunately, selling the houses was a problem and after 14 years the development of the park stopped. In the end only two houses were sold. The design of the park is typical Gaugi style: undulating walls and pillars decorated with colourful mosaics. The main sights of Park Güell are the entrance to the park with the porter’s lodge, the dragon stairways, the hypostyle room designed as the market for the housing estate and made up of 86 columns. The square is surrounded by an undulated bench decorated with tile-shard mosaics. Gaudi lived in the park for 20 years. His house is now the ‘Casa Museu Gaudi’, where you can learn more about the man and his work. Note: An entrance fee is to be paid for the most beautiful parts of Park Güell: main entrance, dragon stairways, Sala Hipóstila, Plaça de la Natura and the viaducts. Entrance is via time slots. Every 30 minutes 400 visitors are allowed in. As a result there are long waiting lines especially in the high season. Therefore, it is recommended to purchase your entry ticket(s) in advance. This time slot entry is a big improvement. This is an advantage because the fee-paying part of the park is not overcrowded anymore and taking pictures and selfies has become a lot easier. The rest of the park is free to visit and here you can enjoy sweeping views of Barcelona. Casa Batlló is an absolute eye catcher. It is impossible to miss this striking building when walking through Passeig de Gràcia, you will find the house at number 43. The metro lines L2, L3 and L4 and get off at Passeig de Gràcia. Casa Batlló is one of the famous houses in Barcelona designed by Gaudí. In 1875, Emilio Sala Cortes, architect and Gaudí’s professor at university, designed this brightly coloured villa. Between 1904 and 1906, Josep Batlló i Casanovas, a wealthy textile magnate, commissioned Gaudí to make major renovation and alterations to the building. As with many of Gaudí’s designs, no corner or straight line can be seen in the building. The central figure of Casa Batllo (official Museo modernista de Antoni Gaudí) is Saint George, the dragon-slayer, who played an important role in the history of Catalonia. Mosaics reminiscent of fish scales cover the fairytale façade and jutting out balconies resemble the jaws of sea creatures. The undulating mosaic-covered roof is the spine of a dragon and the turrets on the roof could be regarded as St George’s sword to stab the dragon. Not only the exterior also the interior is imposing: stained-glass windows, colourful wall tiles, eye catching door frames and railings. The large stained-glass window and pillars (inspired by the legs of dinosaurs) in the living room, the arches in the attic and the roof terrace are the most memorable features of the villa. Montjuic hill is close to the Plaça d’Espanya. Walk up the hill from this square or go by public transport. The hill can be reached by bus or by cable car Teleferic. Take the metro to Espanya metro station station and then continue by bus or cable car. 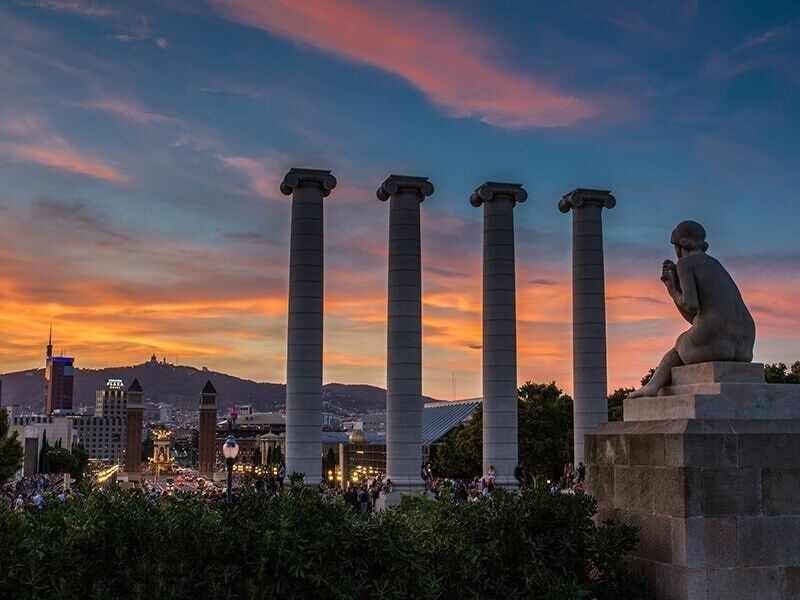 You should spend at least one afternoon at Montjuic during your city trip to Barcelona. This 213-metres high mountain is southwest of Barcelona between the Plaça d’Espanya and the port. During the 1929 Barcelona World Fair palaces, pavilions, parks, gardens and sports stadiums were built on the mountain. Some of these buildings have survived and now serve as museums: Museu Nacional d’Art de Catalunya (MNAC) in Palau Nacional, Pavelló Mies van der Rohe, Caixa Forum in the old textile factory Casaramona, the open-air museum Poble Espanyol and the Fundació Joan Miró, with famous works of this famous Spanish artist. The Olympic Stadium was purpose-built for the World Fair in 1929, but was renovated for Olympic Games in 1992. Castell de Montjuïc is at the top of the mountain. The original fort dating back to 1640 was replaced by the present-day castle in the 18th century. 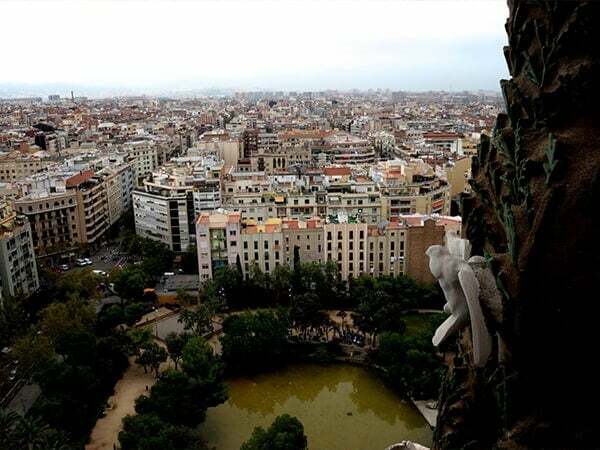 The view of both Barcelona and the Mediterranean is breathtaking. One of the most popular attractions in Barcelona is Font Magica, the magic fountain. Every Thursday, Friday and Saturday evening (during the summer also on Wednesday) a spectacular show of water and light, a mix of music, water acrobatics and light takes place. Montjuic also includes a nature park and botanical gardens. Casa Milà, like Casa Batlló, is situated in Passeig de Gràcia. The house is at the corner, at number 92. Take L3 or L5 to metro station Diagonal is the nearest station to Casa Milà. Casa Milà is another eye-catching building in Passeig de Gràcia and also designed by the world famous architect Antoni Gaudí. 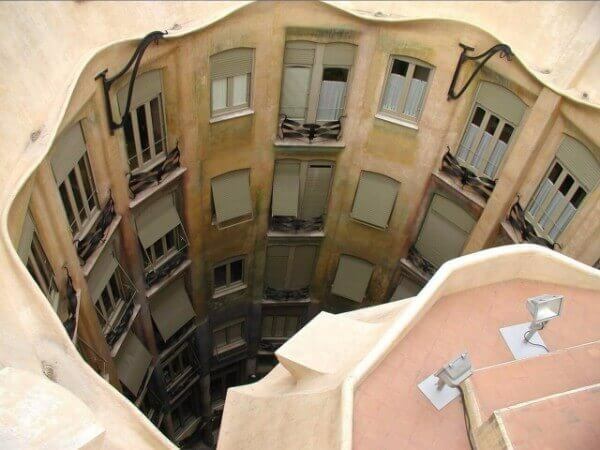 This apartment building is also known as La Pedrera (The Stone Quarry) and, like the adjacent Casa Batlló, a wonderful example of Catalan modernism and one of the most spectacular buildings in Barcelona. It was commissioned by Pere Milà i Camps and his wife is wife Roser Segimon who gave Gaudi total freedom to design the building. Construction began in 1906 and was completed in 1910. Due to a conflict with his patron, Gaudi could not finish the building quite to his wishes. This unusual building with its undulating stone facade, twisted wrought iron balconies has no supporting and no straight walls. The structure rests on a steel and concrete skeleton. Like Casa Batlló, Casa Milà is a true landmark. One of the characteristics of this building is the undulating roof terrace with remarkable chimney pots and air ducts. The roof terrace offers a sweeping view of Barcelona. An interesting exhibition about the works of Gaudí is on display in the attic room. The Columbus Monument is located at the end of Las Ramblas. Walk into the direction of the sea and you cannot miss it. Take L3 to go to Mirador de Colón and get off at Drassanes metro station. Rafael Atché, is a tribute to Columbus. This is the spot near Barcelona port, where Columbus stepped ashore on his return from his voyage of discovery to America. It was here that he informed the King and Queen of Spain about his discovery. The statue shows Columbus who points to something, but nobody knows what he is pointing at. Some say that he points to America. If that were the case, he should point towards Las Ramblas and not to the sea because Columbus defied the seas and discovered the New World. Others claim that he points to Genoa, his birthplace. A swift lift inside the column takes you up to the semi globe at the feet of the Columbus’ statue. 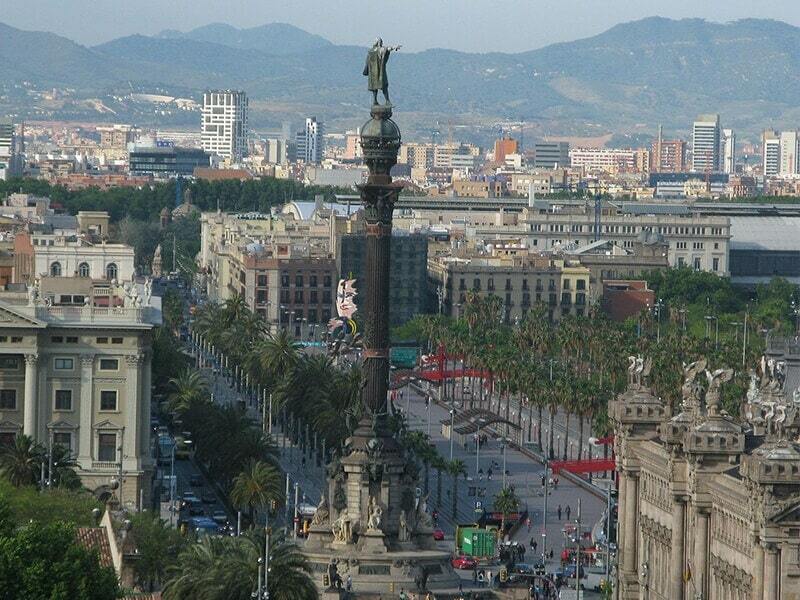 The 360-degree viewing platform offers a fantastic panorama of the city, Las Ramblas and the harbour. Las Ramblas is located in the centre of Barcelona and connects Plaça Catalunya with the port of Barcelona. The street is just over a kilometer long. Take metro L1, L3, L6 and L7 and get off at Catalunya station for the northern part of the Ramblas, get off at Liceu (L3) for the central part and Drassanes (L3) for the southern part of this avenue. Las Ramblas, also known as La Rambla, is a very popular and always crowded with tourists and locals. This 1,3-kilometer long street runs from Plaça Catalunya to Port Vell, the oldest part of the port of Barcelona. If you haven’t ambled along Las Ramblas, you haven’t been in Barcelona! 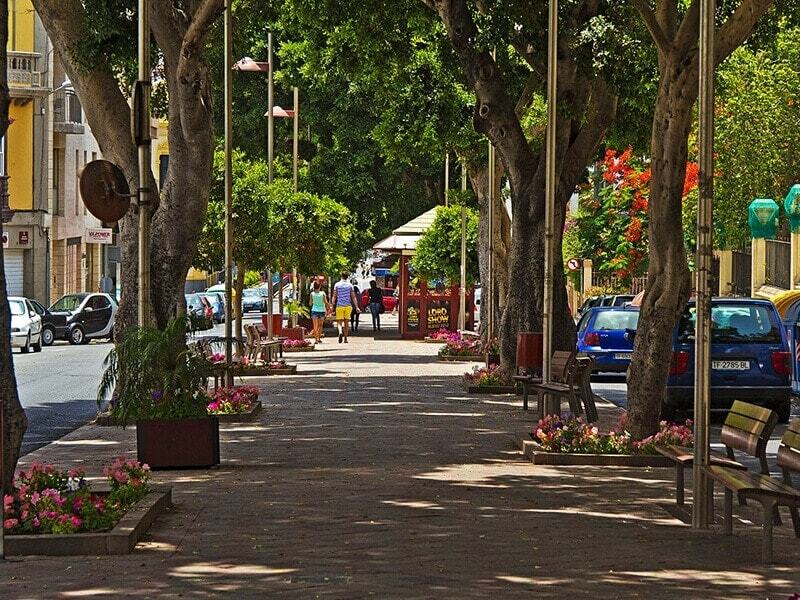 Admire live statues, flower stalls, souvenir shops, outdoor cafes, street musicians and artists. Take your time and also have a peek in the side streets which are equally interesting and home to some of the best restaurants and bars. Square Plaça Reial and the large market hall La Boqueria are also worth a visit. Be aware of pickpockets as they mix with the crowd. The Camp Nou stadium is located outside the centre of Barcelona on the Carrer d’Aristides Maillol, but is easily reached by metro or bus. Take l3 or L5 to metro station Camp Nou.Alternatively, you can take L3, get off at Maria Cristina, Les Corts or Palau Reial or L5 to Collblanc or Badal metro stations. It is a 10-minute walk from these stations to Camp Nou. 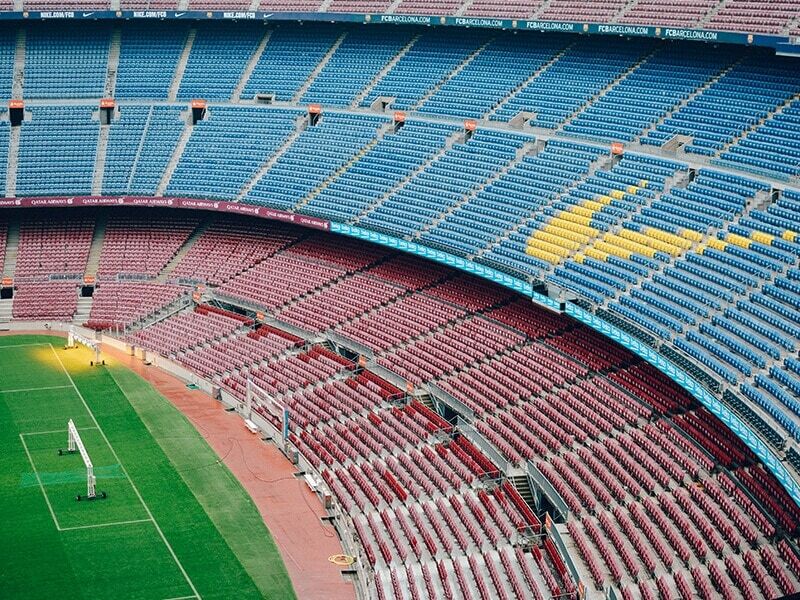 Camp Nou is a must-visit for all football fans! With a capacity of 99,354 spectators, Camp Nou, the football stadium of FC Barcelona, is one of the largest stadiums in the world. Camp Nou was opened on 24 September 1957 during the festivities of La Mercè, the patron saint of Barcelona. Join the Camp Nou Experience – guided stadium tour and museum visit – and experience the thrill of entering the pitch from the tunnel. The Museu Futbol Club Barcelona exhibits all the prizes, cups, photos, films and scale models of the club. You will also learn about the history of FC Barcelona. The stadium tour also includes a visit to the press room, the commentator boxes, the changing rooms, the players’ tunnel and of course the stadium itself. It goes without saying that you can attend a FC Barcelona home game! After all the sightseeing and shopping in Barcelona, it is time to have a meal. That is a true pleasure in Barcelona because Catalan cuisine is famous. Check out restaurant is La Pubilla and enjoy local food. Being in Barcelona and not eating tapas is like going to Paris without visiting the Eiffel Tower. Sensi Tapas (Carrer Ample 26), Ca L’Isidre (Carrer de Les Flors 12) and Bar El Velódromo (Carrer de Muntaner 213) specialize in tapas and Catalan dishes. There are more locals than tourists in Bar El Velódromo, so brush up your Spanish! Barcelona is famous for its restaurants with one (or more) Michelin star. Recommend are Tickets (Avinguda del Paral.lel 164), Lasarte (from Martín Berasategui, Carrer de Mallorca 259), Pakta (Carrer de Lleida 5), Disfrutar (from Eduard Xatruch, Oriol Castro and Mateu Casañas, Carrer de Villarroel 163) and ABaC (of Jordi Cruz, Avda, Tibidabo 1). It is recommended to book a table if you want to dine in one of these Michelin-star restaurants. Be sure to eat Spanish paella at least once. The best district for this tasty dish is La Barceloneta! This neighbourhood is close to the beach and brims with restaurants that serve fresh paella or other fish dishes. Serious foodies should go to the trendy bars and restaurants on Carrer del Parlament and Passeig de Sant Joan. Carrer de Blai, known as the ‘pintxos street’ of Barcelona. All these serve very budget-friendly meals. End your evening in one of the many theater or concert halls on the Avinguda Paral.lel, one of the main streets in Barcelona. Try to avoid restaurants at Las Ramblas, they are tourist traps and overpriced. Restaurants just off Las Ramblas offer much better value for money. Follow in the footsteps of the locals and go to the neighbourhoods of El Raval and El Born where you will pay non-tourist prices, mix with the locals and see fewer tourists. Restaurants in Barcelona open for lunch at 14.00 hours, at 18.00 hours tapas are served. Some restaurants are open only between 20.00 and 21.00 hours. Mercat de la Boqueria is the most popular and most touristy market in Barcelona. This covered market on Las Ramblas is the best place to buy products from Catalonia. You will find here fruit, vegetables, fish, meat, cheese, nuts, sweets, chocolate, spices and souvenirs stalls. La Boqueria is open from 8.00 am to 8.30 pm but is closed on Sundays. The Mercat de Santa Caterina (Francesco Cambo 16) is one of the hippest Barcelona market halls with its undulating roof covered with brightly coloured ceramics. The Mercat de Sant Antoni, built between 1872 and 1882 by architect Antoni Rovira i Trias, is the largest market in Barcelona. The flea market with new and old books, stamps, postcards, coins and calendars is open on Sundays and located next to Sant Antoni market hall. Mercat dels Encants Vells (Avinguda Meridiana 69) is the oldest flea market in Barcelona and paradise for lovers of second-hand goods. Barcelona is made for shopaholics! Every street seems to be a shopping street. There is a shop for everyone from well-known Spanish fashion chains like Zara, Mango, Pull & Bear, Bershka, Stradivarius and Desigual to large department stores and shopping centres and also designer shops, exclusive boutiques, specialty stores, second-hand items and vintage stores. Barcelona has it all. Popular shopping streets in Barcelona include Portal de l’Angel, Carrer de Pelai, Avinguda Diagonal and Rambla de Catalunya. 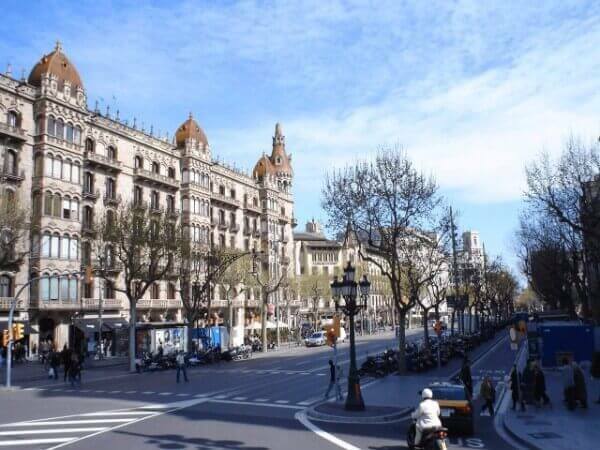 Passeig de Gràcia is more expensive and at the higher end of the market. Here you will find Chanel, Louis Vuitton, Jimmy Choo, Max Mara and Rolex. The El Born or Gràcia districts abound in nice boutiques and small-scale stores. Most vintage and second-hand stores are in El Raval. Is it too hot to be outside and are you longing for a cool place or do you simply want to go shopping indoors with one shop next to the other? One of the many Shopping centres or department stores is your place to be! El Corte Ingles department store has branches everywhere in Barcelona. The flagship store is on Plaça Catalunya. Maremagnum shopping centre is located on the sea front next to the Columbus Monument. Las Arenas is a very special shopping centre because it is in old bullfighting ring on the Gran Via de les Corts Catalanes. Its exterior still looks like the old arena, but the interior has been modernized and there are a lot of shops. L’Illa Diagonal, Pedralbes Center, Bulevard Rosa and Gran Via 2 are other shopping malls in the centre of Barcelona worth exploring.